Scientists found intersex fish in three river basins in Pennsylvania, a sign that the water may be tainted with chemicals from human activity. Male smallmouth bass with female characteristics -- namely, immature egg cells in their testes -- were discovered in the drainage areas of the Susquehanna, Delaware and Ohio rivers, according to a new study led by the U.S. Geological Survey (USGS). "The sources of estrogenic chemicals are most likely complex mixtures from both agricultural sources, such as animal wastes, pesticides and herbicides, and human sources from wastewater treatment plant effluent and other sewage discharges," study author Vicki Blazer, a fish biologist with the USGS, said in a statement. Estrogenic chemicals disrupt the endocrine system, which regulates the release of hormones like estrogen and testosterone, interfering with the fish's ability to reproduce. Bass seem to be especially prone to becoming intersex when exposed to estrogenic compounds, Blazer and colleagues said. 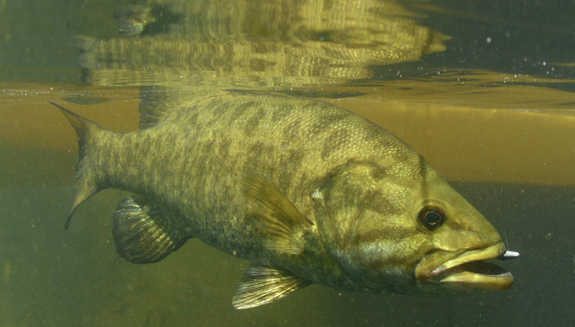 Researchers with the USGS previously found intersex smallmouth bass in the Potomac River Basin, similarly linked to endocrine-disrupting chemicals, or EDCs. For the new study, Blazer and colleagues collected fish from 16 sites in the Susquehanna, Delaware and Ohio river basins. Intersex males were found at every site where smallmouth bass were collected, and the severity of their condition was generally worse in places just downstream from wastewater treatment plants, the researchers found. The researchers also sampled white suckers and redhorse suckers. Neither species showed signs of intersex characteristics, although the team did find an egg cell precursor in the blood of some white suckers. The most common hormone found in water and soil samples was estrone, a potent EDC often found in sewage from wastewater plants and the manure of animals like cows, chickens and pigs, the researchers said. It's not clear exactly what the study means for humans, but Blazer said, "I think any findings on the effects of endocrine disruptors may have implications for humans who can be exposed via the water they drink but also through other ways." Endocrine-disrupting chemicals can be found in pharmaceutical drugs, personal care products, herbicides and pesticides, but the difference is fish are constantly exposed to what's in the water, Blazer told Live Science in an email. "Certainly, there are some ways scientists are beginning to discover and understand EDC effects on humans, although, as you might expect, it is much harder to prove as we can't experimentally expose humans," Blazer said. However, conditions like low sperm counts and testicular cancer in men, as well as breast cancer, obesity and autism have been linked to EDC exposure, she added. The findings were published online in the journal Environmental Monitoring and Assessment.